Strictly Business - Go For It! 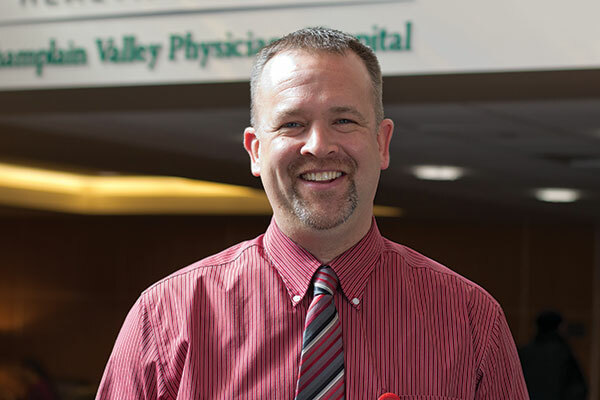 Mike Recore is a 40-year-old nurse at The University of Vermont Health Network Champlain Valley Physician’s Hospital in Plattsburgh. His current position is Patient Case Coordinator. He is also a fire instructor with the New York State Office of Fire Prevention and Control, a volunteer fireman with the Morrisonville Fire Department and he coaches boys’ modified basketball for Saranac Central School. He has a Bachelor of Science degree in Biology from SUNY Plattsburgh and a nursing degree from Clinton Community College. Recore worked for Wyeth-Pfizer Pharmaceuticals in Chazy for 11 years and was a research scientist when it closed. He then pursued a nursing career and took a job at the local medical center. I understand why some individuals might be intimidated as they take on a role traditionally held by the other gender. ere are certainly fewer male nurses than female, but that had no play whatever in my decision. I see more and more males going through the area’s nursing programs these days. FOLLOWING ARE EXCERPTS FOR SB’S INTERVIEW WITH MIKE RECORE. Did you ever feel bias when you decided on nursing and pursued that degree? Not at all. Wyeth gave us the opportunity to continue our education with expenses paid and nursing was something I had thought about. My aunt was a critical care nurse and I had been a volunteer fireman and Emergency Medical Technician. No one in school or at the Medical Center ever said anything about gender. There were male nurses when I was growing up, so I never thought of it. I felt as though there were good opportunities in the nursing field and knew male nurses. It never seemed strange to me. Many fire departments in this region have had female fire fighters and EMTs for some time. My parents and grandparents always worked hard and instilled that ethic in my sister and me. The atmosphere was one of helping others and we were taught to do things for neighbors. We weren’t just handed things. We had to earn them. I was always intrigued by the health care field. I knew I wanted to help people. I followed my dad’s lead and became a volunteer fireman and EMT, then got certifications for teaching firefighter courses. Explain how your job as a nurse evolved into your present position. I had been a floor nurse for some time and hoped for advancement. The Director of Patient Care Coordinators asked if I would consider a change. I applied, was interviewed and got this position. You’re called upon to act as a resource for people who have problems or complaints or emergency situations. Being in management gives me a much different perspective. I get to see the whole hospital rather than just the unit I was working on. It’s a very active job and I’m still fairly new at it, but I’m glad to have the opportunity to help people this way. We’re on the floors, in the Emergency Room and anywhere we’re needed. We work with the nurses and help direct the resources where they can be best utilized. I consider it a promotion and a fine opportunity to move up. Nursing requires constant learning. This job is the same. You must go into it with a strong desire and passion for learning. No matter whether you are in direct contact with the patients or coordinating their care, things are always presenting themselves differently from the textbook. Are you the only Patient Care Coordinator? No. We have a staff with three full-timers in the position at present along with three per diem. Will you further your formal education? Yes, I’ll be pursuing my Master’s degree so I can be ready for future opportunities. My theory is, go for it, attain it and have it. It’s just like putting money in the bank for later. How can you do so many things outside your profession? It goes back to the desire to help others and make the community better. If we didn’t have fire and ambulance services manned by volunteers, where would we be? You give a little and it comes back to you and your children. Do you have advice for people contemplating a nursing career? Follow your dream. Focus on your goals. Nursing is not for everyone. It’s a hard profession, but rewarding. Be sure you’re suited to it and willing to work harder than you ever imagined. Then, go for it. Remember, you are the person the patient looks to most. You’re in and out of the room all day. You’re the one both patient and doctor rely on to pick up on changes in condition. Don’t feel as though you have to compete with the other gender. I never did.